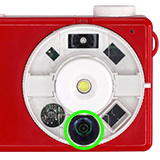 The lens wheel has three optical modules that allow you to take three types of photos. Used to take normal perspective photos with a horizontal field of view of 40°. 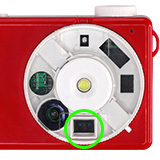 Used to take wide angle photos with a horizontal field of view of 80°. The captured photos will appear bulgy, and must be processed using Bigshot's software to create panoramas. Used to take 3D photos with a horizontal field of view of 16°. 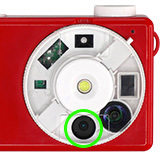 The captured photos will have two side-by-side copies of the same scene, and must be processed by Bigshot's software to create anaglyphs (3D photos) that can be viewed using the provided red-cyan glasses. Wear the glasses such that the red filter covers your left eye.